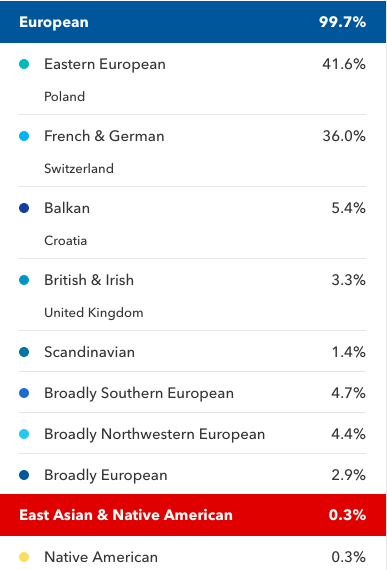 Based on family lore, I would have expected to find myself being primarily German and Croatian, but it turns out I’m mostly Swiss, Polish, and Balkan, with some German, Hungarian, Ukrainian, and British (!) spice thrown in. Apparently the mysterious British ancestor was part of the family within the last two hundred years, which makes it especially interesting. My paternal side of the family were Swiss Anabaptists, who became Amish and Brethren on this side of the ocean, so perhaps some of them stopped in England en route to the New World long enough to leave some genetic roots behind. Or maybe some New England Puritan came down to Pennsylvania and joined the family? It’s not likely that I’ll find out, but it’s fun to speculate. Fascinating stuff. Grab yourself a kit when they go on sale again for Black Friday. « Cannon to Right of Them, Cannon to Left of Them	» Who Cares What Picture We See?